First I’d like to apologize for a term I’ve mis-used in the past, that of the OEM. I’ve always considered manufacturers of specific types of industrial equipment to be “OEM”s, or Original Equipment Manufacturers. After looking carefully at the various definitions I’ve found, most sources consider OEMs to be manufacturer’s of components used in other manufacturer’s end products. This is not what I have meant, and stand humbly corrected. What I have been mischaracterizing I will now refer to as “IEMs”, or Industrial Equipment Manufacturers. What I am talking about are companies that build a specific type of industrial equipment over and over again without much customization, such as packaging machinery, metal and plastic forming equipment (presses, injection molding machines and the like), testing machines, and other equipment controlled by PLCs. The dilemma is that while often very technical, these machines and systems are often designed once and then modified very little afterwards. Unlike custom machine designers, IEMs do not generally need a staff of mechanical and controls engineers. People who start these kinds of companies often have a wealth of knowledge in their field of expertise, which is why they create and develop innovative equipment in the first place. I have talked about my friends over at NAS (Nalle Automation Systems) before. Tom Nalle had worked in the packaging industry for a long time before starting his company. He knew just about everything there was to know about packaging before coming up with his own innovative method of sealing film; he then leveraged that into a standard set of equipment. This is how a lot of companies get started. In general, inventors and innovators who start these “IEM” companies are mechanical whizzes rather than controls experts. Especially when they first start out, their main focus is on ensuring that the machinery looks good and performs well. In the case of NAS, I was fortunate enough to be in on the controls aspect of NAS machinery right when the company began. Since I knew the controls field well, I like to think that they got a good electrical and controls design from the start. Often when I look inside the panel of IEM equipment I see controls that look like more of an afterthought. This panel is a junction box on a press that costs a half million dollars. A few items you may notice right away if you are a panelbuilder: 1. There are no terminal block labels. 2. The wires are not very straight and there is no wireway. 3. The wire labels, though you can’t read them in this picture, are numbered 1,2,3,4 etc. I have discussed wire numbering in a previous post; as a matter of fact I even did a poll on the subject. One conclusion I came to was that IEMs often tend to design their equipment this way, probably because the primary focus when the equipment is designed is on the mechanical side. The same is true of the PLC programs I see in this equipment. When the product is initially designed, the inventor or designer of the equipment goes out and looks for whatever local resources they can find. They are usually on a budget as a fledgling company, and the first electrical person hired often doubles as a service technician. After all, its not like something new is being designed every few months. 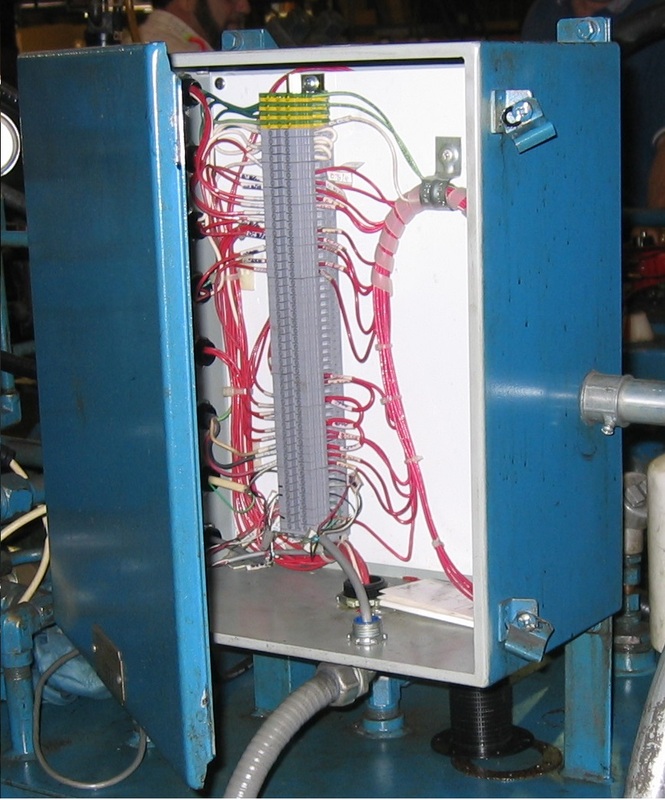 So unless an Industrial Equipment Manufacturer consciously decides to go out and hire experienced electrical and controls design companies, that part of the machinery often lags the mechanical side. It is simply not economical for them to hire a full time controls professional. And even if they did, a good controls engineer who has been exposed to the wide variety (and excitement) of challenging custom work would soon be pretty bored building the same thing all the time. Documentation is often another problem. If the concentration is on the mechanical side of the equipment, there is a good chance that any electrical CAD work is also substandard. Manufacturers of standard equipment like this often don’t even know there is a problem, and unless the customer complains they probably never will. They have no standard to compare it to. If equipment is sold into a manufacturing facility, the maintenance people probably know since they see equipment built by large professional custom builders, but the information generally doesn’t make it back to the IEM. A common method of avoiding these problems is to find a professional controls company early in the development process. There are “controls houses” in every state in the country, and finding help is usually not difficult. 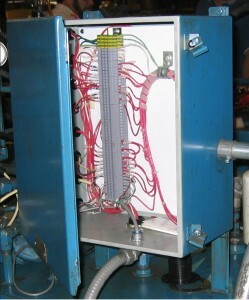 Controls companies do design and programming for a wide variety of industries and have seen all kinds of applications. An early investment in professional help can save a lot of headaches later! Mr. Lamb, Very good article. It sums up a lot what I’ve experienced in my 35 years of machine development. I am usually the clever ME that comes up with innovative ways to achieve whatever it is we’re attempting. But what I find when I hire a controls company to help, even though I specify everything and spell out all of the controls logic required, somehow the controls company ends up making as much or more profit than I do. It is not a case of bad budgeting or low info. Customers (my customers anyway) very often have a figure in mind that squeezes overall costs regardless of value to the customer. Little reward for a lot of effort and creativity… Best regards. Hi Gregory, thanks for the comment! What I am mostly referring to here is companies that can spread the cost of the original design over many projects sold, where the design essentially stays the same. It’s worse if you have to customize the job, even a little. But you’re right, the company paying for the hardware and taking all the risk should be the one making the bulk of the profit.